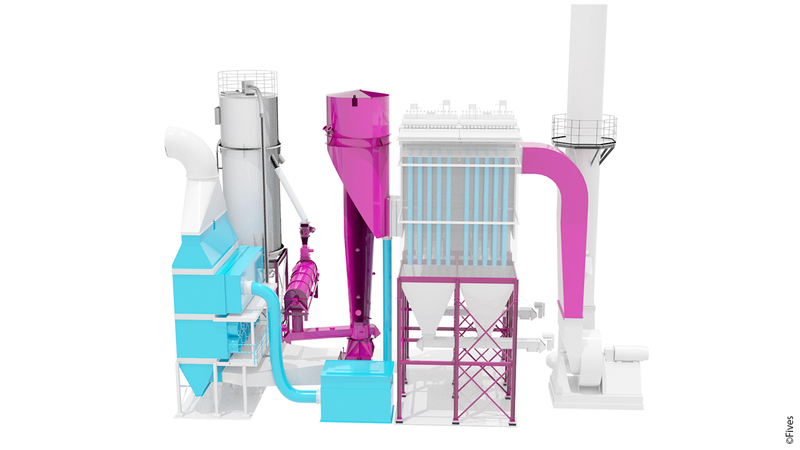 Fives’ EAD-NOx™ systems are catalytic dry scrubbers that have been developed to meet industrial partners’ needs of NOx control, very high performance acid gas (SO₂, SO₃, HCl, HF) scrubbing, particulates removal and capital investment reduction. The EAD-NOx™ is an upgrade of Fives' proprietary Enhanced All-Dry (EAD) scrubbing solution, that integrates the DeNOx function to the system, thus avoiding the addition of an SCR or an SNCR. This solution uses ceramic catalytic filter elements or catalytic bags instead of regular fiber glass bags after injecting urea/ammonia. It also uses a heat exchanger to be able to achieve acid gas removal at low temperature and NOx control at high temperature. The EAD-NOx™ allows us to achieve up to 97% NOx removal efficiency, while treating SO₂, SO₃, HCl, HF and other acid gases at over 99% removal using integrated dry sorbent injection. The reagent recirculation loop and the proprietary Conditioning Drum increase the efficiency of the reagent and optimize its consumption. This reduces consequently the operating costs of the process. particulates, ash, SO₂, SO₃, HCl, HF, mercury, dioxins/furans, heavy metals, VOCs, NOx.